One caveat to that last point. Over the long haul, stock prices rise a lot, but fall only a little. For example, as discussed in this article, “money invested continuously since 1993 in the S&P 500 resulted in a 9.22% return. But missing the 10 most lucrative days over that same period slashes the return in half. Miss the 60 best days and the numbers turn negative.” Even worse, nobody knows when the best – or worst – 60 days will take place. We are nearly nine years into the current bull market. Based on the traditional view that says a 10%-20% decline represents a correction, and a fall of more than 20% represents a bear market, it is too soon to say whether we are experiencing a correction, the start of a bear market, or simply a pullback. But, as discussed here, we are not that surprised to see the market fall. The combination of relatively high valuations and an extended move higher increased the likelihood of at least a correction. But, the rapid pace of the retreat may still be a little unsettling. At its Monday lows, the Dow saw its biggest intraday point decline in history (back to 1900). It closed 1,175 points lower – the greatest single-day decline in market annals. However, in percentage terms, the market fell 4.6%, which was only the 108th biggest percentage drop in history. The last time the Dow fell this much in a single day was August 2011. However, it was at 10,700 then. Monday, it closed at 24,345 – more than twice as high. But, it sounds a lot worse in absolute terms than percentages. Keep in mind that the decline of the past few days has mostly just erased the year-to-date gains. At Monday’s close, the Dow was down about 1.5% year-to-date; the S&P 500 had fallen a little less than 1% lower. For some historical perspective, Monday’s decline in the Dow was about 1,175 points. In 1985, the Dow started the year at about 1,199. At the same time, the Dow and the S&P 500 are both down about 8.5% from their highs of January 26th, approaching the 10% mark that would represent a correction. At this point, a correction seems likely. While corrections can be painful, they are a lot more common historically than they have been recently – about once a year according to Deutsche Bank. It has also been nearly nine years since the last bear market ended (March 2009), which is also a long time by historical measures. On average, the market has a 5% drop about twice a year. In 2017, the maximum drawdown was around 3%. 1. They make the market more generous than other investment alternatives. Investors get the opportunity to buy stocks at cheaper prices. Lower prices encourage investors to assume the risk of owning stocks rather than less risky investments such as cash or high-quality bonds. 2. When market volatility increases, some investors engage in panic selling. This provides long-term investors a valuable opportunity – the chance to buy stocks on sale. This lowers the cost of the stocks you buy, which benefits your long-term returns. It is also why it can pay to be patient and hold some cash when prices seem too high. What Factors Could Have Caused the Market to React the Way It Has? It started with Friday’s wage report – wages were up 2.9% year-over-year, marking the strongest gains since mid-2009. This provided the strongest evidence to date that the job market has tightened to the point where companies need to pay workers more. This raises the potential for inflation and heightens the risk the Fed could raise interest rates three times this year; perhaps four, or even more. Higher interest rates worry stock investors. One of the reasons shares appear so expensive by most valuation measures is they look relatively cheap when compared with low-yielding Treasuries. The recent tax cuts will also result in less being withheld from paychecks, meaning more cash in workers’ bank accounts. At least some of that is going to be spent, increasing demand and leading to companies hiring even more workers to keep up. Plus, businesses, who receive the biggest piece of the tax cut, will use some of their windfall to pay higher wages to get the workers needed to meet the demand growth. As a result, the Fed might decide that even four rate increases are not enough. Of course, we say this knowing that a week or two ago, before stocks tumbled, analysts were saying that modestly higher interest rates and inflation, as well as lower taxes, were good for stocks. The truth of the matter is we never know for sure how headlines will move the market, or how quickly the views might change. One of the most dramatic examples came on election night in 2016 when S&P 500 futures fell more than 100 points. The market rose the next day. A few months earlier in late June 2016, the market fell sharply after British citizens surprisingly voted to exit the European Union. Less than a week later, most of those losses were recovered. The market ended the year about 10% above its pre-Brexit levels. Even when we look at more impactful events such as the fall of the Berlin Wall, the World Trade Center attacks, geopolitical conflicts in the Middle East, and the assassinations of Martin Luther King and John F. Kennedy, we see little market impact. In the big picture, these events were not even a blip. The truth is that even now nobody knows with certainty why the stock market crashed in September 1929 or October 1987. We cannot provide a rational explanation for the market’s recent decline either. What Monday’s fall does provide is a reminder that investing in stocks will not automatically make us rich. Twice in the past 20 years – between 2000 and 2002, and again between 2007 and 2009 – the stock market cut investors’ wealth roughly in half. We do not know with even a modicum of certainty if that will happen again this time. However, we know that it can. If the market’s recent decline leaves you uncomfortable, it is likely you have too much invested in stocks and should decrease your allocation for your own health and psychological well-being. The father of value investing, Benjamin Graham is noted for saying that in the short run, the market is a voting machine – tallying up which firms are popular and unpopular. In the long run, it is a weighing machine – assessing the substance of a company. In other words, rather than being a fundamental analyst, the market is a barometer of investor sentiment. Market participants have limited insight into what is really happening in terms of fundamentals, and any intelligence that could be behind their buys and sells is obscured by their emotional swings. Accordingly, it would be wrong to interpret the recent worldwide drop as indicating the market “knows” tough times may lie ahead. In our view, speculating or reacting to what might happen is pure folly. We expect the markets to remain volatile at least for the near-to-mid-term. Over the last year, investors became somewhat complacent as market volatility was almost non-existent. If not for its sharp fall on Monday, the Dow would have tied a record by not falling more than 5% from its record high in 394 days. It was only a little more than two weeks ago that The Wall Street Journal’s MoneyBeat blog noted the Dow increased 1,000 points (from 25,000 to 26,000) in a record-setting seven days. Not to be outdone, on Monday, it fell more than 1,000 points in a single day. Once the current downturn is over, many will say they predicted the end of the decline (after the fact, of course). Before you find yourself guilty of the same thing, ask yourself: do I know what is going to happen tomorrow? Next week? Next month? Is it a good time to buy or sell? Does anybody really know what is going to happen in the future? To keep yourself from exhibiting this kind of hindsight bias, you can record any predictions you may have as well as those you hear about or read from others. Pull them out a month, or even a year from now and see how right they were. Chances are you will find that while it looks obvious at the time, the actual outcome will be a surprise. We know what happened in the past. Recent market activity is simply a data point on a chart that, unfortunately, does not tell us what will happen in the future. A sell off can never really be attributed to a single factor. 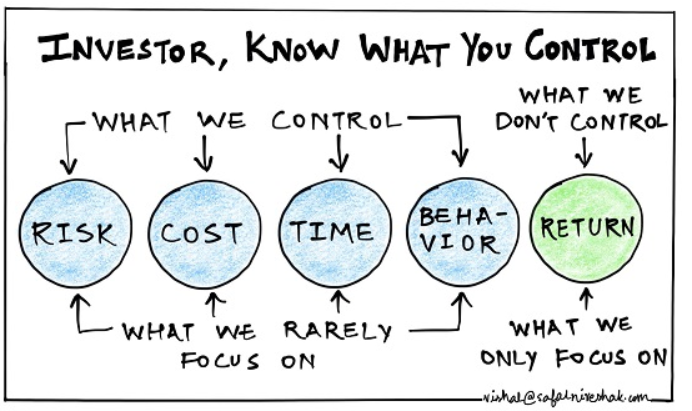 However, investors are always quick to assign one. Doing so provides an illusion of control. Truthfully, we have no idea of what comes next. Long-term investors should not let their emotions get the best of them. Overreacting to the latest news or market performance is not beneficial. Markets can swing wildly in reaction to events such as last week’s job report, investor concerns, political events, or many other occurrences. Retirement plans represent investments for the long term, so it is unlikely that significant changes to portfolios are needed even in a turbulent market. For long-term investors, times like these can represent opportunities to add value. Some stocks are likely to fall more than the related news truly justifies. No one has a crystal ball telling them what will happen next. In such an environment, it is important to stay true to your process and focus on identifying high-quality assets as you attempt to navigate these uncertain waters. At Apprise, we look to take advantage of whatever opportunities the market may present. If you want to stop feeling miserable, the best advice we can provide would be to stop worrying about the market’s short-term fluctuations. Instead, focus on the long term and evaluate your investments relative to whether they provide you the opportunity to meet your long-term personal and financial goals. If recent market events make you want to check and see how your portfolio is performing relative to your long-term goals or financial plan, please fill out our contact form, and we will be in touch.